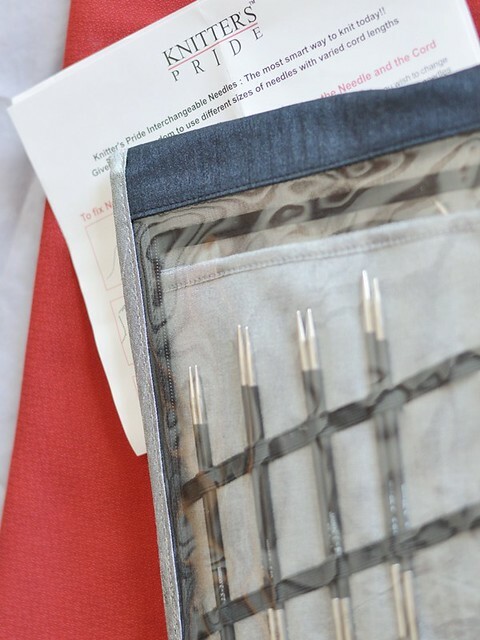 I have a problem with my needle collection – it’s getting old. Old might not be a problem for metal needles, but I have a lot of wood needles in my stash and they start to splinter and split after years of use. So I was really excited when the awesome folks at Knitter’s Pride offered me a test set of Karbonz. Nothing like a set of interchangables to revitalize an aging collection of tools. 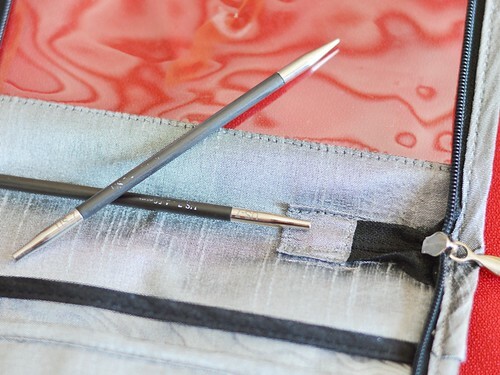 Now, I like quality knitting tools (I own more than one set of signatures) and I’m not a huge fan of aluminum needles (true fact: they bend as I use them. Maybe I should learn to relax?) 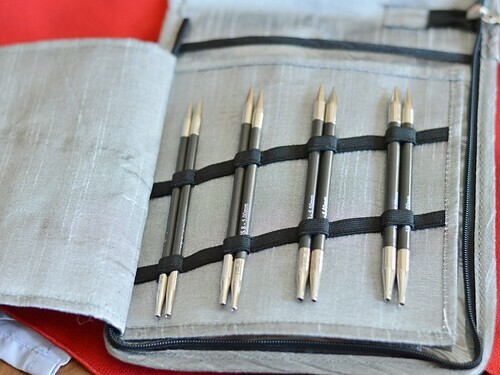 These Karbonz needles feel like quality right when you take them out of the case. That’s probably because they’re made of carbon fiber, the same stuff they make high tech vehicles from! This makes them very strong, and the metal tips mean the fibers won’t split with use (like my wood ones did) The carbon fiber isn’t quite as smooth as metal, but it’s much smoother than wood. So these needles are in the middle for grippiness. How do they perform? And it held up to my abuse beautifully. Really, the only point that showed any wear at all is the printed size number on the side of the needle. While that is obviously just about gone after just two projects each needle is also imprinted with the size on the metal end. Overall, I love these new needles. I’m a DPN girl when working little baby sleeves or socks. But for hats, sweaters, skirts, etc… I love working in the round. And these needles will make so many projects easier and faster. I’m excited to finish up the collar on this little red sweater and find something to cast on next! 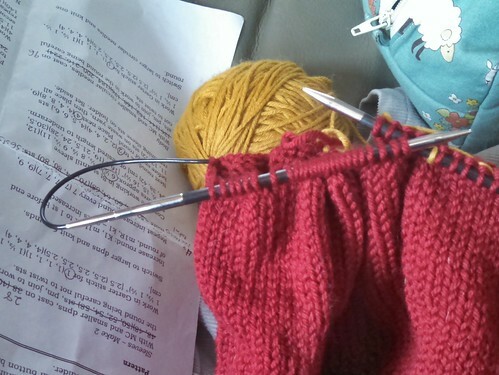 This entry was posted in Uncategorized and tagged knitting, review. Bookmark the permalink. I love my Karbonz. Happy for you that you got to try them!! I’m a long-time Addi girl here, but maybe I ought to try the Karbonz! If you love addis you could also try knitter’s pride platina which are metal. Unless you’re looking for a more textured needle in which case carbon fiber might be perfect! Thanks for the review, Becky! I tend to use wood or bamboo needles, but I wear them out – maybe I’ll look into the Karbonz next time I need to replace something. I’ve had good luck gently sanding the tips of wooden needles, then rubbing them with a little wax. It doesn’t fix them permanently but smooths over the rough patches for a while. But I think carbon fiber could be a better long term solution! Thanks, Becky, for the reply. I knew nothing about the knitter’s pride platina (going now to check it out). I’m assuming the carbon fiber, being more textured, may slow my knitting speed down. I also don’t have a problem with a needle being “too” slippery. I’ve changed over to Karbonz for my sock knitting as I found myself gripping yarn too hard. The Karbonz are the right amount of grippy and slippy. Glad you’ve found them to be comfortably to knit with. I’m sorry you got a set with a defect. I’m not affiliated with Knitter’s Pride so I don’t know what their arrangement is with their distributors. I hope when you went back to the store where you bought them that they were able to help. Thank you….I am still searching for the needle that works for me. 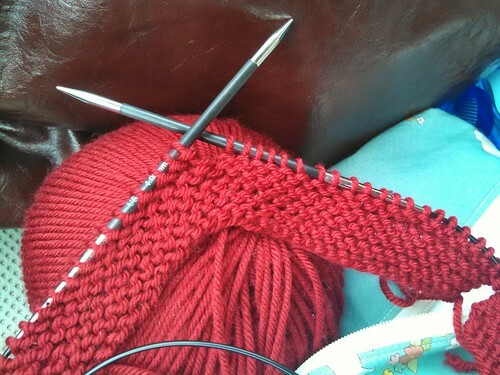 I an new at knitting and find the aluminum too slippery and the straight needles unwieldy. I paid a lot of money for an interchangeable and the tip fell out of the metal. :-[ After reading this I spoke with the company and my tip is in the mail, no questions asked. but I ramble, I just wanted to thank you for this review.